A great writeup about a long-standing “tasting group” of which I am proud to be a member. Thank you so much Judith Smelser and Orlandowineblog! On any given Friday afternoon, some of metro Orlando’s most interesting back-vintage wines can be found, not poured by a sommelier in a fancy dining room, but strewn unceremoniously across a back corner table at Antonio’s downstairs cafe and market in Maitland. For the last quarter century, a small group of wine collectors and enthusiasts has been gathering there each week, bringing treasures from their cellars to share at an invitation-only tasting. It’s not a dressy or formal affair – many of the guests come in shorts and t-shirts – but the wines they bring are anything but everyday sippers. My wife and I had the good fortune to accompany friends to the Chef’s Table at Victoria and Albert’s restaurant for the occasion of celebrating a 40th birthday. While my wife and I have had the opportunity to dine at the chef’s table before, this was the first time for the other three couples. 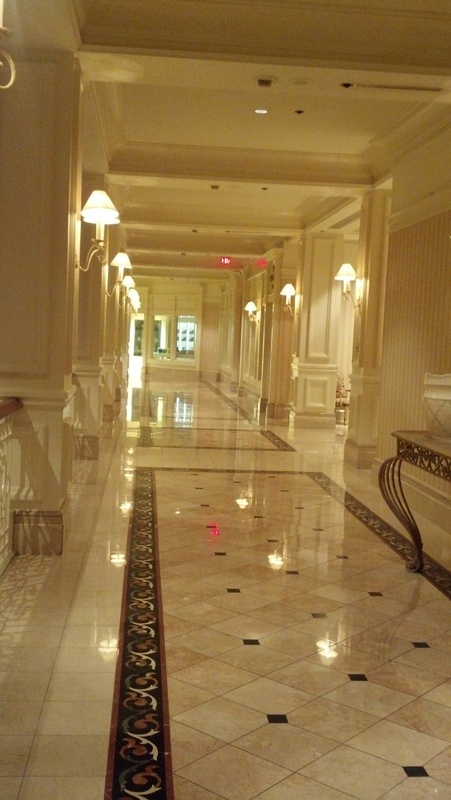 We arrived at 5 pm, and were soon escorted through the empty dining room and into the kitchen, winding the maze from the expediting station, past the pastry/dessert room, the prep stations, and finally to the dining table. We were introduced to Dan and John, the two gentlemen tasked with attending to us during our dinner experience. Dan announced that we would be receiving a glass of Champagne as a greeting and introduction to our dining experience, and that the chef would soon arrive to greet us as well. We were provided a flute of Non Vintage Piper Heidsieck Cuvee 1785 Brut. The Champagne had a rich mousse, with notes of brioche and green apple, and set a wonderful tone for the evening’s festivities. 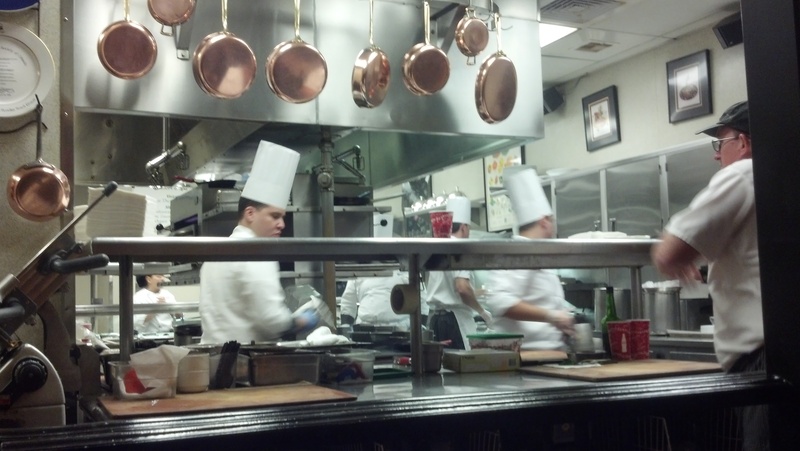 I had been expecting to see Chef Scott Hunnel, who presides over Victoria and Albert’s as Chef de Cuisine. 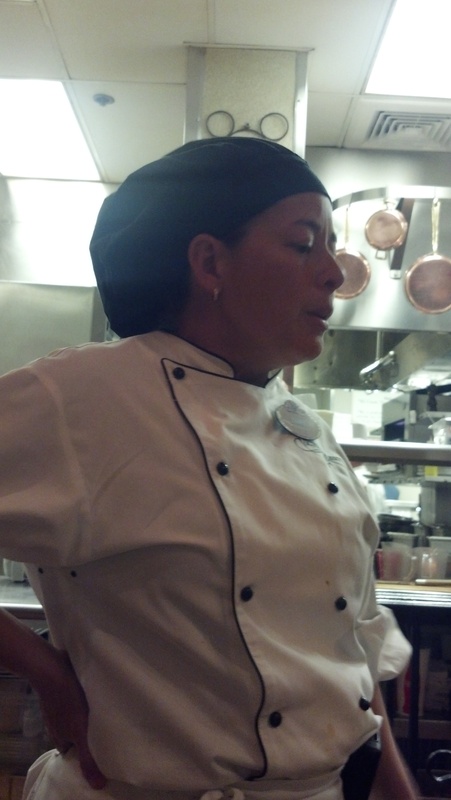 To my surprise, we were greeted by Chef Aimee, and we soon found ourselves in extremely capable hands. Chef Aimee gave us the visual tour of the kitchen, pointing out each of the stations, and naming the chefs at each place. Chef Aimee went on to tell us about Chef Erich Herbitschek, the Master Pastry Chef that provides not only the desserts for the restaurant, but also all of the breads. One of the diners expressed concern regarding the desserts, and would there be enough to satisfy her sweet tooth. Chef Aimee assured us that if the two planned desserts were not sufficient, she would make sure we got a third. Dinner began with the Chef’s Amuse – a plate of four little bites to make our mouths happy. 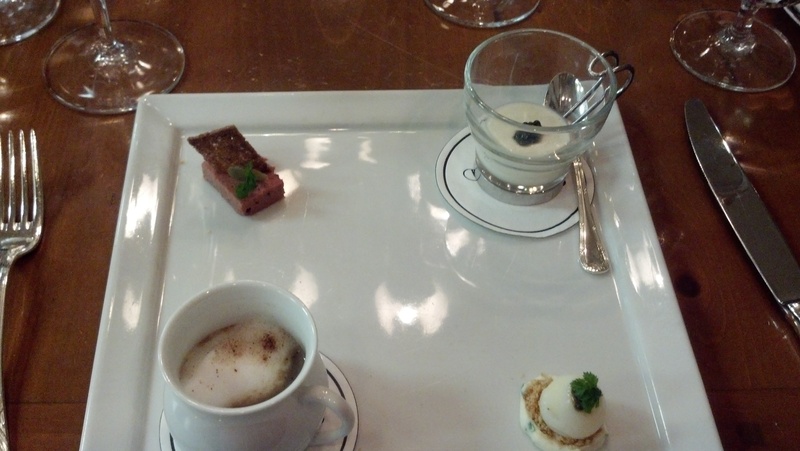 The tasty bits consisted of a soft poached quail egg over brioche crumbs with Galilee Osetra caviar, a cauliflower panna cotta with a German Osetra caviar, chicken liver terrine on a toast point with a brunoise of cornichon, and a porcini cappuccino. The next dish was Gulf shrimp and heirloom tomatoes with a charmoula sauce. The shrimp were wrapped in Serrano ham, then pan seared until the ham crisped and the shrimp were cooked perfectly. The shrimp were served over a French lentil salad with a brunoise of carrots, parsnips, and other root vegetables, some petit lettuce, and a dollop of Bouratta cheese. The earthy, spicy notes of the sauce accented the Serrano, and played a nice counternote to the creaminess of the lentils and the cheese. 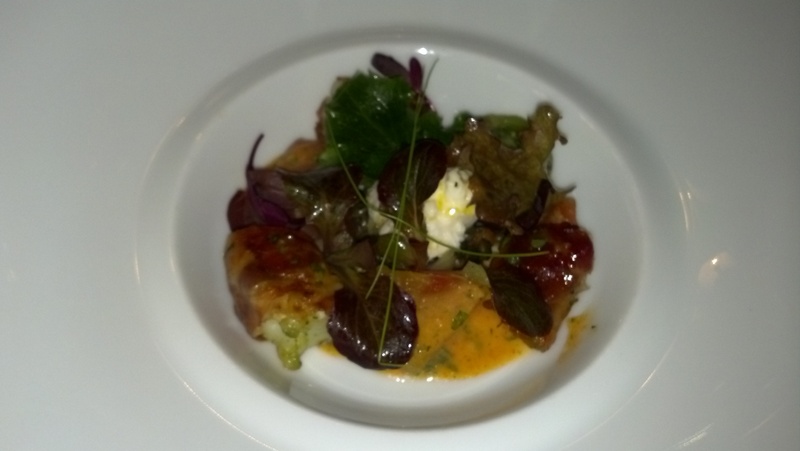 The dish was paired with the 2009 ‘Les Tuilieres’ Sancerre from Michel Redde et fils. The fruit-forward nature of the wine, with citrus, apple, and stone accents and bright acidity, made it a wonderful accompaniment to the dish. The first of the three bread and butter pairings for the evening was a fresh baguette with an unsalted, cultured butter from Vermont Creamery. 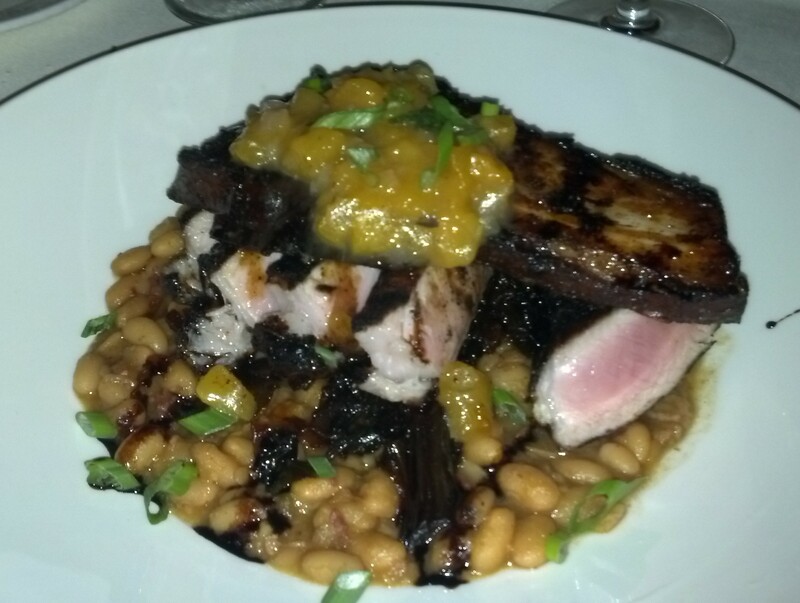 The following plate was a cold “smoked” Niman Ranch lamb with Fuji apple and curry dressing. The dish was presented on a raised bowl with a series of vents beneath the food. 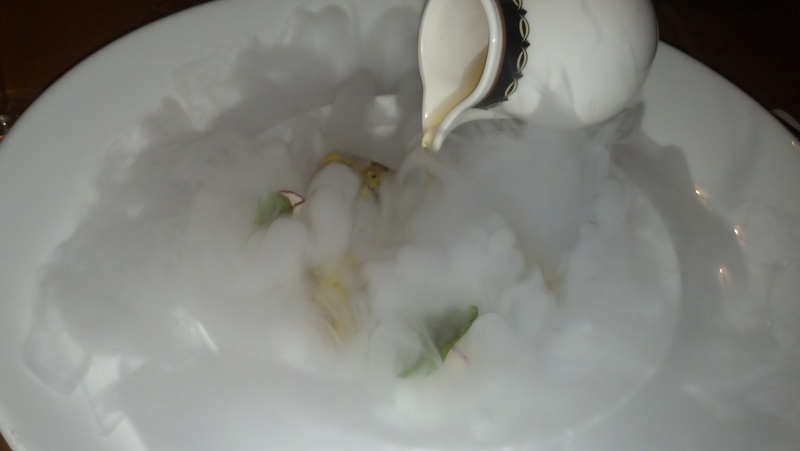 Staff then poured a sauce over the dish, and as it seeped through the vents, smoke began to rise, as there were pieces of dry ice secreted below. The lamb had been seasoned perfectly with garam masala, and then sauced with an apple curry, with garnishes of poached Fuji apple, shaved radish, and beet leaves. 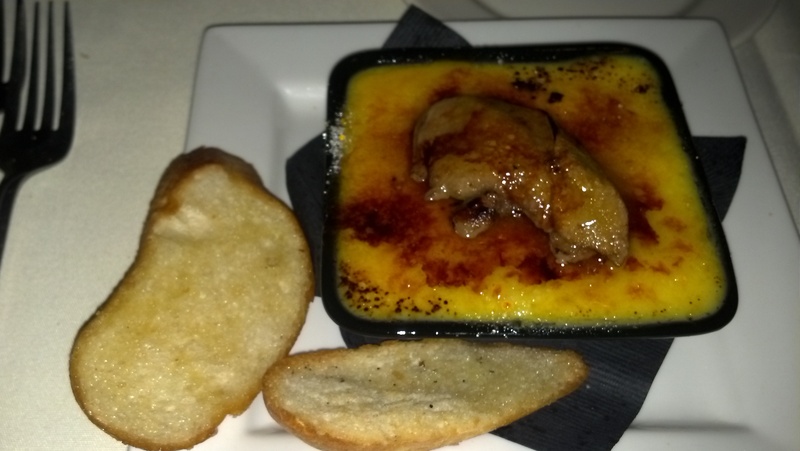 Chef noted that the dish was meant to be eaten with all of the elements in each bite, and that proved to be a very tasty combination. 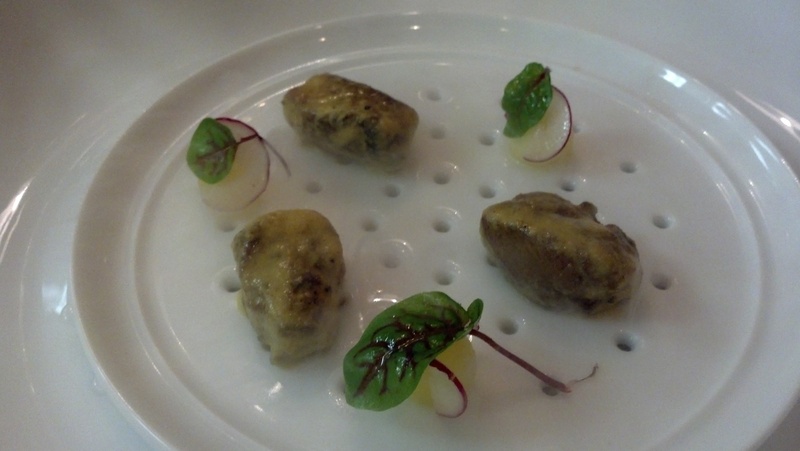 Accompanying the dish was a 2003 Valwinger Herrenberg Riesling Auslese from Dr. Zenzen in the Mosel region of Germany. The apple and sweet notes paired well with the curry, and the acidity of the wine ensured that it was not too cloying. 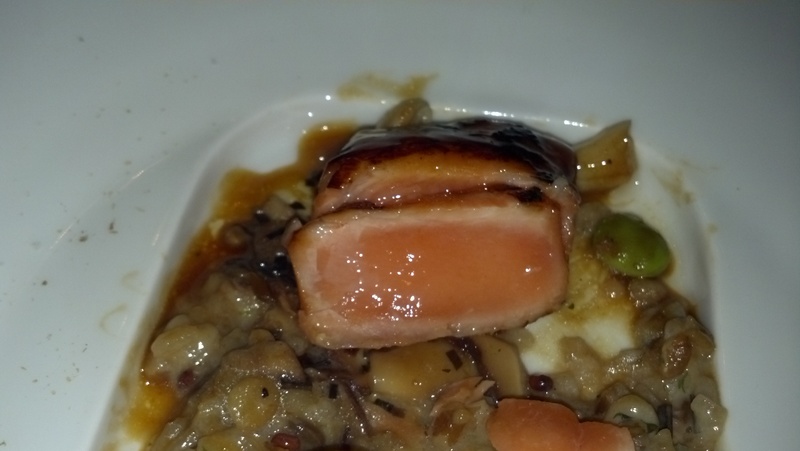 Next up was Alaskan salmon with bamboo rice and soy beans. At least, that is the description provided on the menu you receive at the end of the evening. To me, the words on the menu do not do the dish justice. 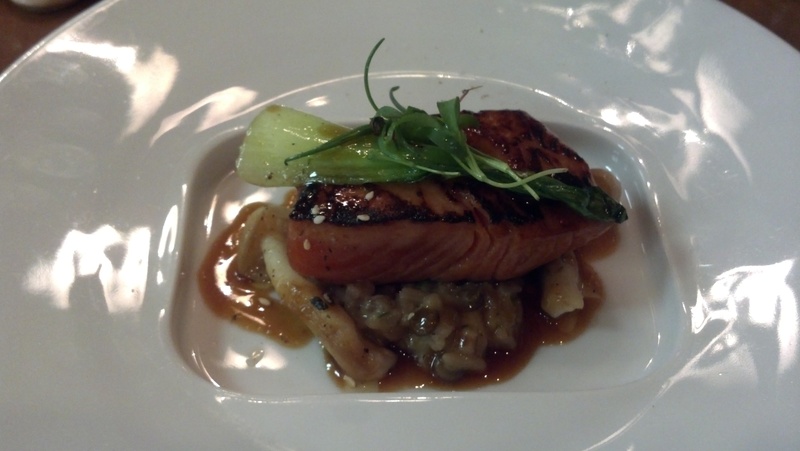 The fresh Chinook (King) salmon was marinated in sake and soy, then served over the bamboo rice which tasted as if it had been prepared risotto-style, with baby maitake mushrooms and a red chili and miso sauce, and then dressed with baby bok choy and micro cilantro. With a nod to the Japanese bent to the preparation of the salmon, the dish was paired with sake – Kanbara “Bride of the Fox” Gohyakumangoku Junmai Ginjo, Nigata. This rice wine had a nose of lime zest, melon, and roasted nuts. The mouthfeel is very clean and smooth, with a long, slightly off-dry finish. The second of the three bread and butter pairings for the evening was a truffled brioche with a truffle butter. 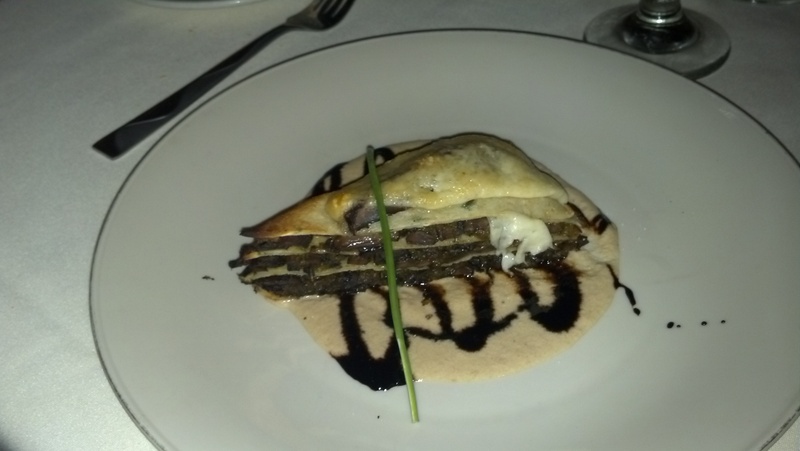 The subsequent dish was poulet rouge with calamarata pasta, forest mushrooms, and black truffles. The poulet rouge, a heritage breed originally from France but sourced by the restaurant from North Carolina, was served as a thick slice of breast meat, cooked perfectly and very moist, served with a mushroom duxelle inside a tube-shape pasta, and dressed with shaved black truffles and a mushroom demi-glace. The restaurant chose the 2007 Land’s Edge Vineyard Pinot Noir from Hartford Court Winery as the pairing, and this was likely my favorite of the wines offered, and the best of the pairings. This is a lighter, feminine-styled Pinot by California standards, with strawberry and red cherry aromas and flavors, accented by allspice, cinnamon, and cola. At this point, the table decided that it was time to take a break. 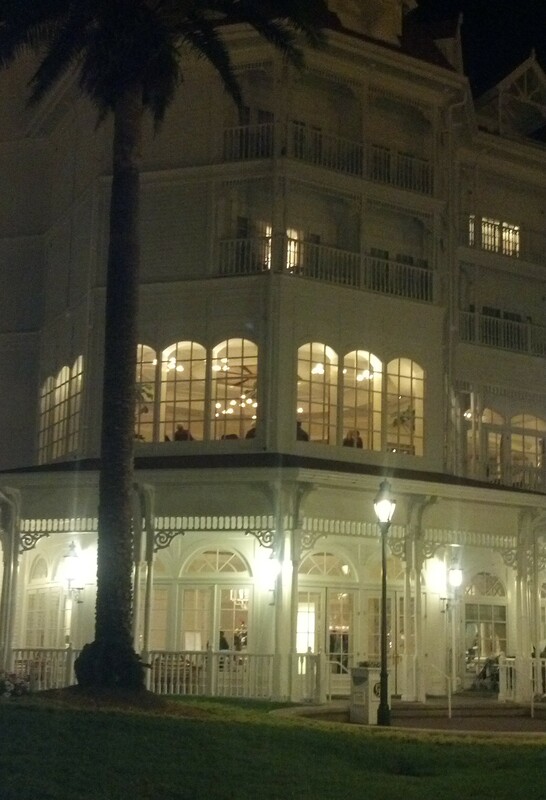 We left the kitchen, and took a walk through the lobby of the lovely Grand Floridian Hotel, and then a stroll outside through the grounds. The weather was cool by Florida standards (already in the low 40s by mid-evening), and this contributed to a brisk pace to our walk. Upon our return, we were soon greeted by our next course – Minnesota elk tenderloin with a braised red cabbage tart and Brussels sprouts. Again, the menu description is a dis-service to the artistry of the plate. The elk had been seared, and then coated in a mixture of fresh herbs and panko bread crumbs. It was cooked to a perfect medium rare. It was plated with an apple and wine kraut with bacon, baby Brussels sprouts sautéed with Asian pear over a vanilla-scented pear puree, and a slice of red cabbage tart in a delicate and flaky crust. Paired with this course was the Ceretto Rossana Dolcetto d’Alba, Piedmont 2010. Red cherry and floral aromas, with red fruit and a bit of cured fruit flavors (reminiscent of Amarone). I enjoyed this course so much, that there is not a picture available. The final of the three breads was a low-salt multigrain loaf, paired with salted Vermont butter. The second of the meat courses then arrived at the table – Kobe-style Australian Wagyu beef with a garlic-potato puree. 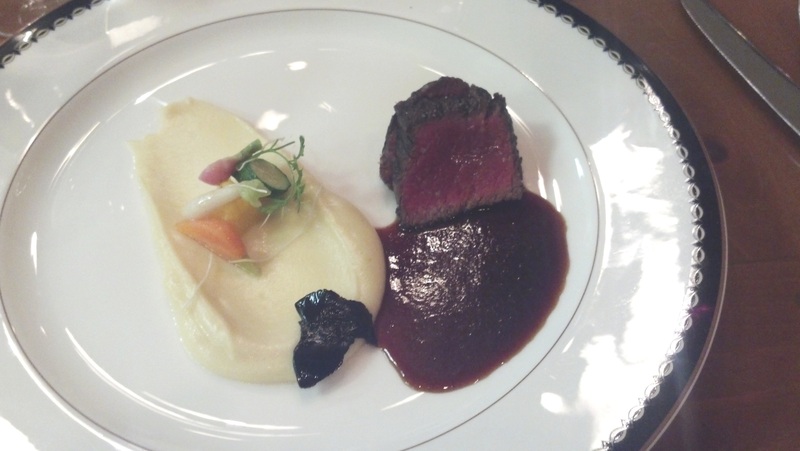 Silky and tender beef, served just beyond rare, with a smooth puree of potato flavored with smoked roasted garlic. On top were petite vegetables from Chef’s Garden Farms in Ohio – petite carrots, baby zucchini, garlic roots, and micro parsley. The final garnish was a slice of black garlic – garlic that has been fermented and cured. 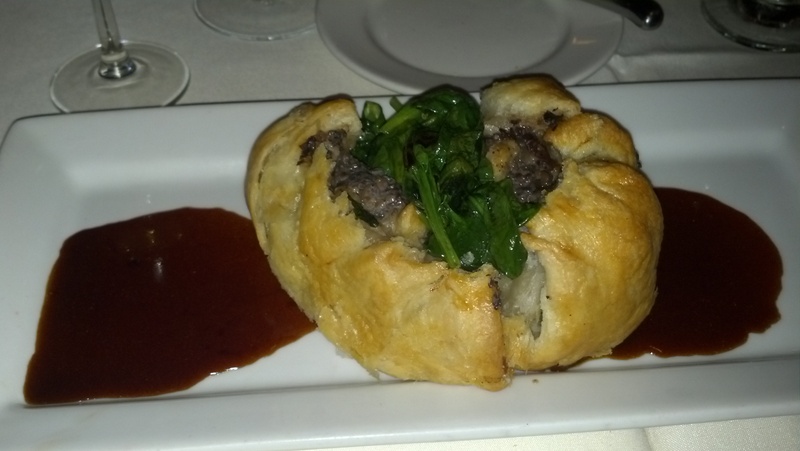 The dish was paired with the Molly Dooker Maitre D’ Cabernet Sauvignon, South Australia – 2009. This wine is very fruit forward and provided a nice counterpoint to the savoriness of the dish, with black cherry, blackberry, and cassis notes, as well as hints of both chocolate and vanilla from the oak barrels. 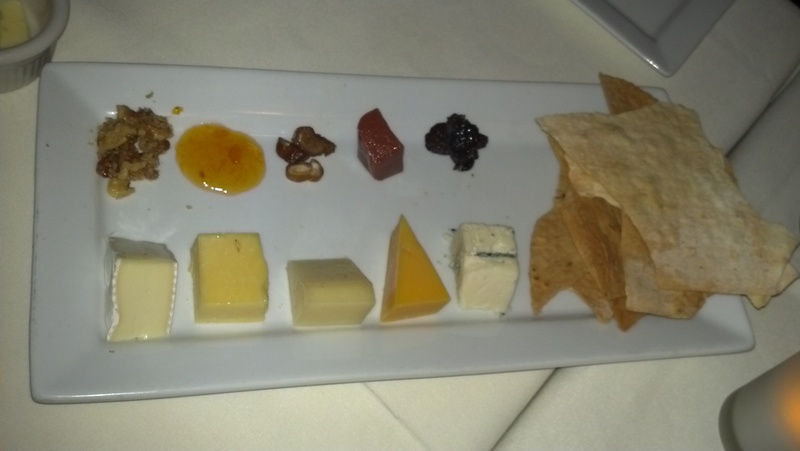 The next to appear was the cheese course – a selection of four tastes of cheese with accompaniments. 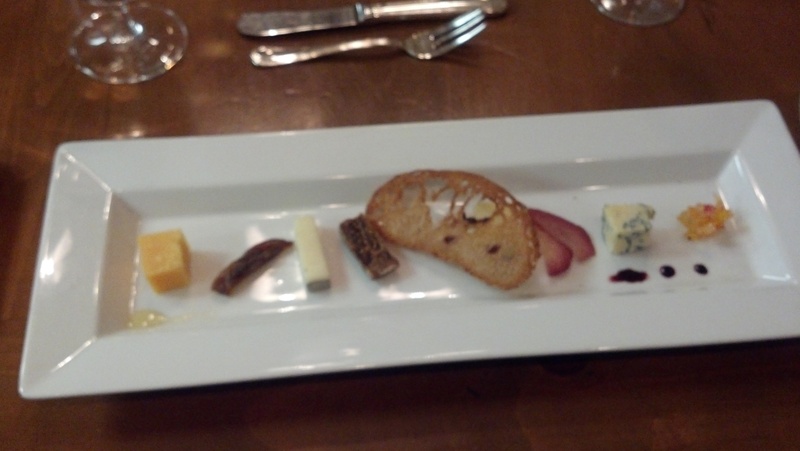 The cheeses included Fiscalini cheddar from California, a 2 year Gouda Reypenaer XO, a Colston Bassett Stilton, and a Sottocenere al tartufo, an ash-rinded Italian cow’s milk cheese from the Veneto studded with truffle. The accompaniments were tupelo honey, a date cake, a slice of pear poached in Burgundy wine, a rye toast, and a brunoise of candied Italian fruit. 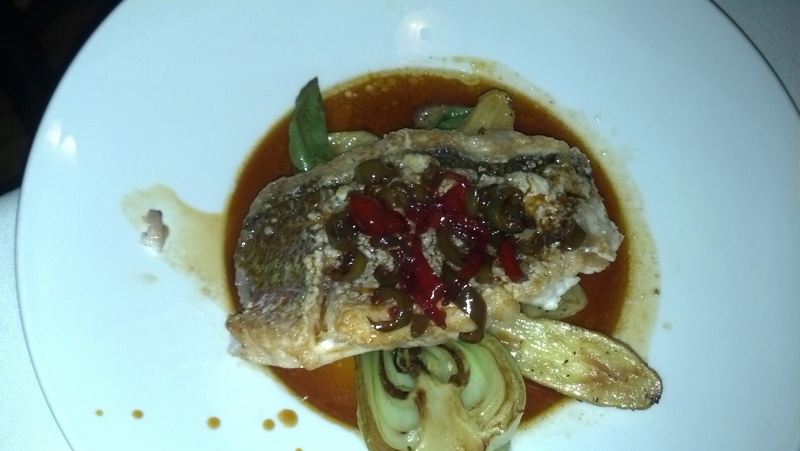 This course was paired with a 2006 Quinta do Crasto Late Bottled Vintage Port. The sweet richness of the port blended nicely with the cheeses, and added an accent to the fruit accompaniments. The first dessert was a testament to the skill and artistry of the staff under Chef Erich’s direction in the pastry kitchen. 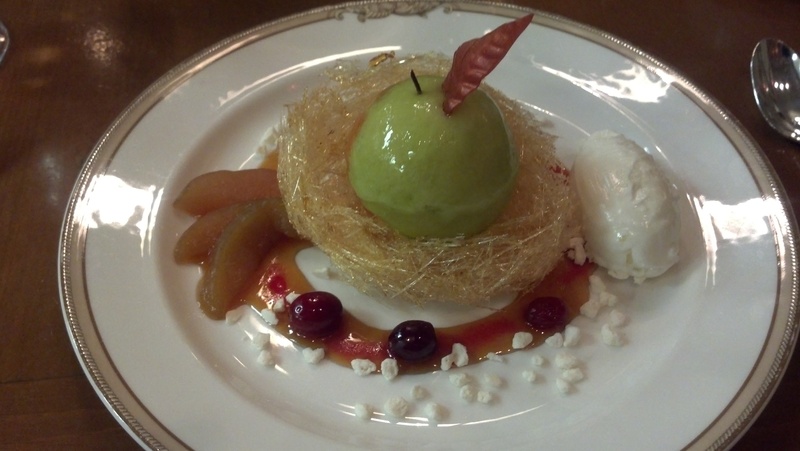 We were treated to a green apple baba with sour cream ice cream. I sound like a broken record at this point, but the menu description just does not do the dish justice! The apple spice cake with an apple mousse filling was in the shape of an apple, had been decorated with color and a gloss coat so as to appear to be a real apple on the plate, and was topped off by a stem and a red sugar leaf. It sat in a nest of finely spun sugar, and was accompanied on the plate by poached Pink Lady apples, poached cranberries, meringue flakes, and a quenelle of sour cream ice cream. The wine pairings selected by the restaurant were complete at this point, but I had brought along a celebratory bottle to share with the group – a Vilmart Cuvee Rubis Rose Champagne. One of the finest rose grower Champagnes, it provides light red fruit, a creamy mouthfeel, and brisk acidity, and paired well with all of the desserts for the evening. 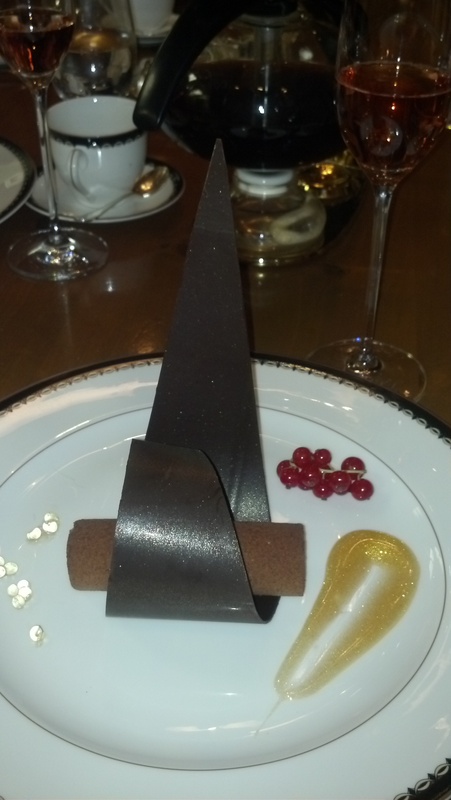 The second dessert (chocolate course) was an architectural marvel. A Peruvian chocolate cylinder lay on the plate, composed of a light, fluffy mousse surrounding a dense chocolate core. Wrapping around the cylinder and rising off the plate was a tempered chocolate sheet flecked with gold flake. Helping anchor the piece in place and somewhat hidden in the background was a small sphere of white chocolate and a sprig of red currants. Balancing the plate were a shimmering elder flower sauce (also with gold flake) and caramel caviar (little balls of liquid caramel encased in molecular gastronomic gel). On a separate small spoon was a chocolate bubble, looking for all the world like a brown egg yolk. 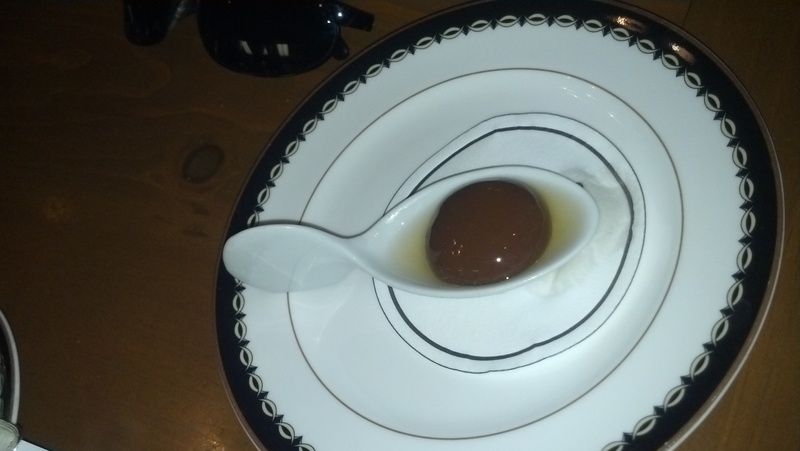 Also a product of molecular gastronomy, the chocolate was a smooth liquid, flavored with a bit of vanilla cognac. True to Chef Aimee’s word (and without prompting from the table), a third dessert appeared… Friandises, or small bites of candies and petit fours. In all, there were an additional seven different bites on this dish, ranging from mimosas – orange crème flavored with champagne and the dipped in chocolate, raspberry and orange gelees, white chocolate dipped truffles, the restaurant’s take on cherry cordials, and (my favorite) – chocolate-wrapped candied orange peel. I cannot conclude this post without also mentioning the coffee and brewing system used at V&A’s. 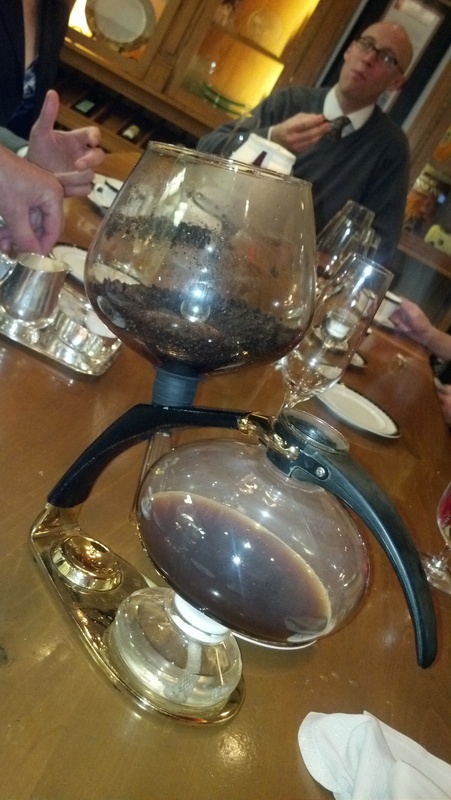 They brew Celebes coffee in what is called a vacuum percolator. A vacuum brew coffee maker looks a lot more elegant than most machines, and at first glance, simply doesn’t look like a coffee maker at all! Two glass globes fit together to compose the apparatus, and these are seated together by a rubber gasket for an airtight seal. 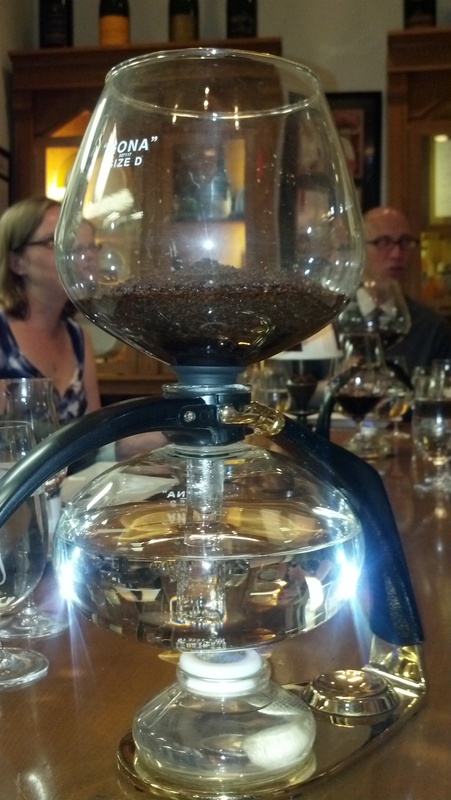 The upper bowl has a hollow glass shaft that extends down into the lower globe, and that shaft is topped with a filter that separates the coffee grounds from the liquid, with the grounds placed in the upper globe – sitting on top of the filter – and the required amount of water needed to brew the grounds placed in the lower globe. With the globes fitted together, the water is then heated until it reaches a boil. Pressure in the lower globe increases as the water boils, forcing it up the shaft into the upper globe, and releasing the water over the top of the coffee grounds. After all the water has been forced through the tube and into the upper globe, the heat source is removed and the lower globe is allowed to cool. As the lower globe returns to room temperature, the pressure in the globe decreases, vacuuming the now-brewed coffee down through the filter and into the bottom globe for service. 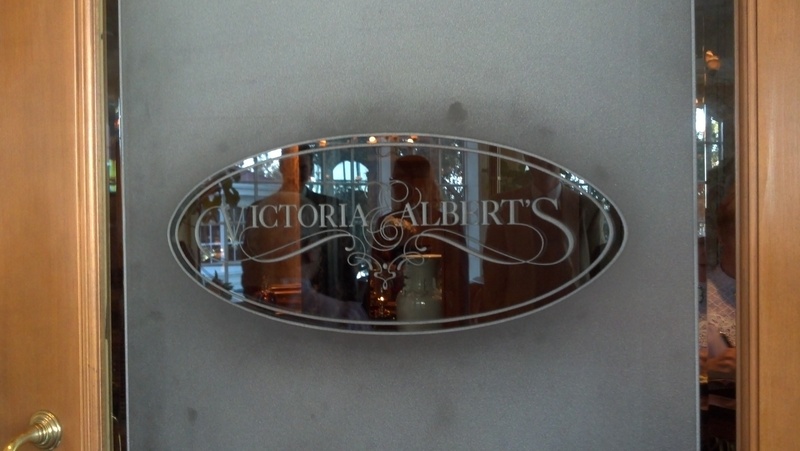 While not an every week, every month, or perhaps even every year experience, those who love fine dining, have a slightly foodie or geeky bent, and enjoy a level of service unparalleled in the area (if not the state and perhaps the southeast), owe it to themselves to experience the Chef’s Table at Victoria and Albert’s. Thank you to Josh and Paula, Kevin and Frida, and especially Jay and Leighan, for allowing Ouida and I to join you for this wonderful evening of food and friends.